The Cypriot Parliament on Tuesday overwhelmingly repudiated a €10 billion international bailout package that would have set an extraordinary precedent by taxing ordinary depositors to pay part of the bill. 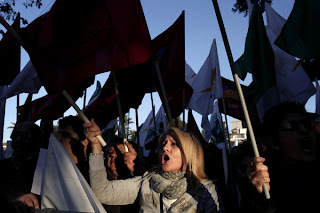 The vote, coming after days of fraught political talks in the Cypriot capital, means that a new deal—if one is possible–will have to be reached in days or Cyprus could face a complete collapse of its banks, an event that many analysts fear could also send the tiny island nation hurtling out of the eurozone. After a two hour debate on the divisive tax, 19 lawmakers from Cyprus' Democratic Rally party, headed by President Nicos Anastasiades, abstained from the vote, a move that secured the rejection of the plan. All other lawmakers in Cyprus's 56-seat parliament voted against the plan. The rejection of the bill leaves Cyrpus with few options. Apart from renegotiating the deal with its European creditors, the government has been working on a Plan B that would involve support for its banks from Russia—a long time friend of the country—but something that looks like a long shot. "It's anybody's guess what the developments will be from this point on," said Theodore Couloumbis, professor emeritus at the University of Athens. "My hope is that there will be a renegotiation. But it appears that a catastrophic scenario is not out of the question: and that is bankruptcy that could lead to a Cypriot exit from the eurozone."